Would this valve work with the Lahara Series? I'm looking at the T17238 shower faucet and would really prefer the pushbutton diverter over the spout stopper. 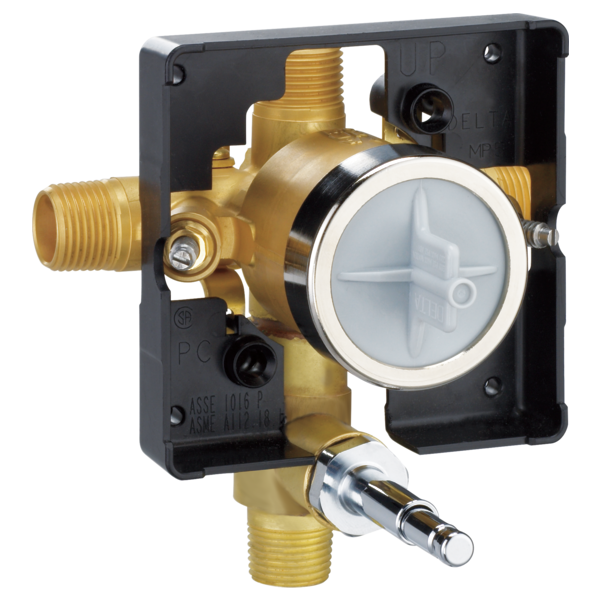 Also, does the valve body come with the push button diverter or do I need to order it separately. Hi Tanya, I knew that the Lahara series trim doesn't have the hole for the push-button but the description for the valve says it ships with a trim kit. I want to know if the escutcheon plate with the hole for the diverter push-button comes with the valve and if it will fit with the Lahara T17238. I looked at the screw hole location on the T13XXX kits and they seem to match. OR...Would I have to buy both trim kits and then just use the escutcheon plate from one of the T13XXX on the Lahara? Would that plate fit the Lahara? As long as it covers the hole in the wall I don't care about it matching. I'd like to install this on the opposite wall from the spout and shower head, so pipes from the valve to the fixtures will be longish. Will it affect valve's operations? Can I use other than 13 series trims provided I drill a whole for the push-button? When I turn on the water to the fixture, a dribble of water is leaking from the divertor button. What can be causing this and what will it take to correct the leak?